MOSCOW, Russia -- Separatists in eastern Ukraine on Tuesday proclaimed a new state that aspires to include not only the areas they control but also the rest of the country. Donetsk separatist leader Alexander Zakharchenko. But Russia, their chief backer, sought to play down the announcement, saying it was merely part of public discussion. The surprise announcement in the rebel stronghold of Donetsk casts further doubt on the 2015 cease-fire deal that was supposed to stop fighting in Ukraine's industrial heartland and bring those areas back into Kiev's fold while granting them wide autonomy. Some rebels said they have no intention of joining the new state. More than 10,000 people have died in fighting since Russia-backed rebels took control of parts of Ukraine's Donetsk and Luhansk regions in April 2014 after Russia annexed Ukraine's Crimean peninsula. The rebels originally sought to join Russia but the Kremlin stopped short of annexing the area or publicizing its military support for the rebels. 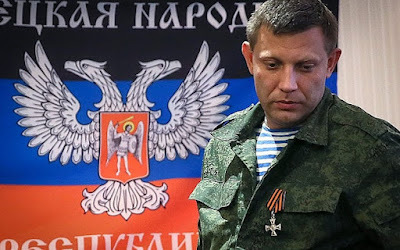 "We believe that the Ukrainian state as it was cannot be restored," Zakharchenko said in remarks carried by the Tass news agency. France, Germany, Ukraine and Russia worked out an agreement in the Belarusian capital, Minsk, in 2015 which laid out a roadmap for ending the conflict between government troops and separatists. Under the deal, the rebels would return control of the territories they had captured to Kiev while Kiev would allow a local election there and grant wide autonomy to the region. "This initiative does not fit with the Minsk process," Gryzlov told Russian news agencies. "I see it merely as an invitation for discussion. This announcement does not have entail any legal consequences." Asked about the rebels' announcement Dmitry Peskov, spokesman for President Vladimir Putin, told reporters Tuesday evening the Kremlin had no comment. In Luhansk, rebel leaders denied that they were part of the deal. Local news website Luhansk Information Center quoted rebel representative Vladimir Degtyarenko as saying they had not been informed of the plans and have "great doubts about the expediency of such a step." The Associated Press has documented how Moscow has been propping up the separatists in Ukraine with funds, weapons and recruits. The Kremlin has firmly denied sending Russian troops to fight alongside the separatists despite the overwhelming evidence.